AI poor Yorick! He hath borne me on his back a thousand times, and now, how abhorred in my imagination it is! Artificial intelligence is no longer the sole preserve of data scientists and science fiction writers, with its technological applications now pervading daily life, says James Fitzgerald. The “Fourth Industrial Revolution” was a term that tripped off the tongues of movers and shakers at the recent World Economic Forum in Davos. Harry Elmer Barnes, the historical sociologist, coined the phrase in 1948, to describe the imminent adoption of atomic energy and supersonic transport by society as he saw it. The media’s coverage of AI has more recently focused on fears around loss of control, and the ethics associated with its impact on the employment market. But the positive implications for health care have also come to the fore in the public mind. A recent sitting of the government’s Artificial Intelligence Committee in the House of Lords heard from experts in an attempt to better formulate a government-wide approach to managing the technology’s myriad effects on society. 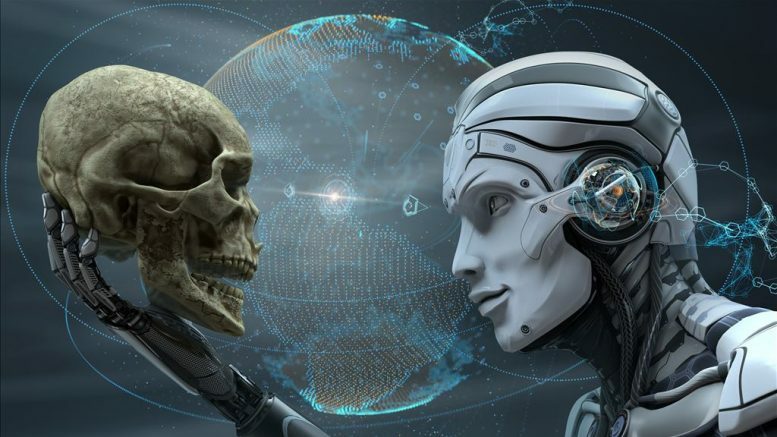 “We have this very particular sense of AI as a world transforming innovation which I think is an unhelpful way of thinking about any technological advance,” David Edgerton, Hans Rausing Professor of the History of Science and Technology at King’s College London told the committee. So, it seems we have been here before — but what evidence exists to the contrary? “This rhetoric is just reheated nonsense from a hundred years ago,” says Prof Edgerton. Peter McOwan, a vice-principal at Queen Mary University of London is not overawed by the technology. “All that artificial intelligence does in the terms defined today is find patterns in data. And we are constantly finding patterns in data ourselves when we are reading something, for example — we are segmenting the letters from the page — and that is all that artificial intelligence does,” says Prof McOwan. This raises questions of science fiction versus science fact. “This is an area that has been full of puff for decade after decade. Now there is some fantastic work going on in machine learning, in algorithms, self-driving cars – all this technology is quite extraordinary. Whether any of it can really be considered as intelligent [is] another matter … I think that AI should be reserved for generalised artificial intelligence; stuff that really does show intelligence,” says Sir David Spiegelhalter, president of the Royal Statistical Society. Academics could learn from Brian Cox and David Attenborough, who have successfully pushed scientific narratives on reductionist astrophysics and Darwinism, respectively, with their engaging and conversational styles. The “affect heuristic” – a quick way to make decisions based on emotional “gut” feeling – comes into play when people warm to a technology. Once you decide something is good, you are likely to discount criticisms of it out of hand. The opposite happens, says Prof Spiegelhalter, with developments such as fracking, where no discernible benefit is perceived – except to a corporation. However, in a world where the consensus reality is formed through the machinery of vested or commercial interests — utilising marketing, branding and lobbyists — questions of choice encompass broader philosophical parameters. Rather than assume that novel techniques just come out of the ether, Prof Edgerton says we must shift the discussion to ask, what kinds of things would we like as a society and how do we ensure they come about? Whether society’s relationship with AI will be guided by commercial imperatives, governmental agendas or hidden vested interests remains to be seen. But the optimal path may start with the questions we ask about ourselves and how this technology might serve us. It is arguable whether the type of AI currently in the public sphere is truly artificial or intelligent. The everyday devices relying on its algorithms could also be described simply as “smart tech”. In a recent Eurobarometer survey, 74 per cent of respondents in the UK said they would make more use of digital technologies if there was more widespread trust of the providers. There is a debate in the industry as to whether it might be better to reduce predictive accuracy in order to have something simpler that can be explained to people – and therefore make it more trustworthy. The news last week that Chinese artificial intelligence is capable of outperforming humans in reading comprehension can only add to public anxieties. A neural network model created by e-commerce group Alibaba outperformed participants on a 100,000-question Stanford University test. The system, developed by Alibaba’s Institute of Data Science of Technologies, scored 82.44, while humans scored 82.304. Microsoft’s artificial intelligence model recently achieved 82.65 on the exam. However, it may still be possible for humans to manipulate their online car insurance renewals (run by simple black box algorithms) by reverse-engineering the answers they give, on address, mileage, driving behaviour, etc — in other words, by lying. A website that briefly appeared in 2010 — PleaseRobMe.com — provided a sharp shock on what simple AI could achieve with snippets of people’s personal data. The website, which only lasted for 48 hours, aggregated information about individuals from the “geo tags” on pictures and posts online and combined that with “time stamps”, so that the system could identify addresses or locations and thereby ascertain whether individuals were at home, allowing those people to be targeted for a household robbery. Facial recognition methods are evolving rapidly and have expanded out of the security sphere to consumer applications, including Facebook’s adoption of the method. Identity politics is becoming a hot topic in cyberspace. “It seems to me that it will be impossible to tell everybody in every situation when they are providing data,” says Prof Spiegelhalter. Which brings in questions over data governance. “Rather than each person having to be responsible for everything that’s being extracted from them, it seems to be a scenario where regulation and governance are appropriate. At the same time, data literacy, especially among children, is enormously important,” he says. “There is nothing free on the web. You give your data and that is your payment,” says Prof McOwan. There may be many benefits from hands-free driving but why should they eclipse the beneficial social and health effects from walking or cycling? David Puttnam, the former film producer, expressed concerns about the “productisation” of people. “I spent the first dozen years of my life in advertising, and by the time I left I had no illusions that if you offer advantages to advertisers to find more information about their customers, they will take them.” Lord Puttnam says he is troubled by the possibilities of data misuse. The UK already has a variety of bodies that provide a regulatory framework. The Information Commissioner’s Office upholds information rights in the public interest, and the Nuffield Convention on Data Ethics has just been signed. A council for data science ethics has also been proposed. But clearly regulatory oversight will need to keep up with a rapidly evolving technology. The parameters of data protection agencies are less defined in a globally connected world, where data havens exist outside of national regulations and protections. Indeed, the question of whether an individual supports or benefits from the use of their data will also further complicate the issue. “Ethics and innovation are two sides of the one coin, where one is about the production and the other is about the control or the criticism. You need both,” says Prof Spiegelhalter.